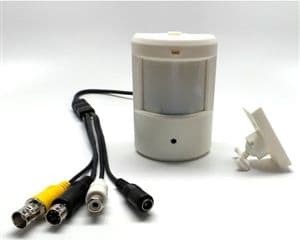 The SYSPRO-AHD2PIR is an HD hidden surveillance camera system that includes 2 AHD hidden PIR security cameras, a hybrid HD surveillance DVR, pre-made video / power cables, and power supplies. The AHD-PIR4 cameras that are included with this system feature a motion detector shaped housing, perfect for indoor applications that require discreet surveillance. The fixed 3.7mm pinhole lens provides the user with a wide angle of view. The 940nm infrared LEDs featured on this camera have an effective range of up to 32 feet and do not emit a red glow, making them completely invisible to the human eye. This surveillance system supports 720p HD video. Watch these demo videos to see how the DVR works. Need a different number of cameras or a mix of various camera types? No problem. You can request a custom quote here. The DVR included with this system is our best selling 4 camera iDVR-E4. Users can upgrade to 8 and 16 camera models if they plan to expand their system in the future beyond 4 cameras. Below are some of the features of the DVR. You can find more details about the DVR here. The AHD-PIR4 cameras that are included with this system. Two sets of 60 foot are included with this system. If you need to extend your cable run longer than 60 feet, you have two options. 2) You can upgrade your system to a RG59 cable spool, connector, and tool kit. This allows you to cut the cable to the exact length that you need. The DVR included with this security camera system is an SD / HD hybrid. This means that both traditional analog security cameras and AHD high definition security cameras can be used. Originally, CCTV cameras supported D1 resolution which is 704 x 480 pixels. Then, 960H CCTV cameras were introduced which support 960 x 480 resolution (a wider format CCTV). In 2014, AHD cameras (analog high definition), also known as HD CCTV, was introduced which supports 720p resolution (1280 x 720). In 2015, full HD 1080p AHD cameras will be available. All of these CCTV video formats work using the same RG59 coax cable to run video from the camera to the DVR. However, the video encoding is different between traditional CCTV (D1 and 960H, also known as standard definition - SD) and AHD. This iDVR-E works with both traditional CCTV and AHD cameras. Users can also mix CCTV and AHD cameras on the same recorder (hybrid). Important! If both camera types will be used, they need to be grouped in pairs of 2 by type. For example, you can have 2 SD cameras on channels 1 and 2, and 2 AHD cameras on channels 3 and 4. You can also install SD cameras on all channels or HD cameras on all channels, but again, when you mix technologies, it must be done in groups of two. You can learn more about what AHD is here. The iOS app lets users access the live view of their security cameras from remotely over the Internet. The iOS app works on iPhone and iPad devices. The app also supports remote search and playback of recorded surveillance video footage (video that has already been recorded to the DVR hard drive). The Android app has all of the same great features as iOS. Users can view their security cameras live and also play back recorded video footage on the DVR's hard drive. The Mac client software that is included supports remote viewing and recorded video playback. The Windows client DVR software supports remote live camera viewing and recorded video playback. In addition to the client applications for Mac and Windows PCs, users can also access their DVR from a web browser. Below is a playlist of videos that show many of the features of the DVR included with the security camera system on this page. You can select which video that you want to play by clicking on the PLAYLIST icon in the upper left of the player. CCTV Camera Pros can provide a custom surveillance system quote with any number of cameras SD and HD security cameras that you need. As you have probably already seen on our website, we have 2, 4, 8, and 16 camera surveillance systems in pre-made packages. However, it is not possible for us to package up every combination and quantity of all the different camera models that we carry. We can provide you with a custom quote with as many cameras as you need and a mix of any combination of camera model(s) based on your project requirements. Want to login to one of the HD systems at CCTV Camera Pros warehouse in Florida? Please use form to request demo login information.